Home › New Zealand › How’d you like them eggs? How’d you like them eggs? It’s a common enough question heard daily in greasy spoon cafes. The answer is usually related to preferences for poaching, scrambling or frying but the question took on a slightly different meaning in the Auckland War Memorial Museum recently. Lined up in the majestic atrium of the museum were 20 eggs, a small portion of the 100 eggs decorated by NZ artists, celebrities and designers, even an All Black, for the Big Egg Hunt. All Black ,Kevin Mealamu’s egg. Spot the cauliflower ear? Visitors to the museum were playing the ‘which one is your favourite?’ game. It’s almost impossible to pick one favourite. The artists have exercised their imaginations and harnessed all their talents to create eggs that burst with colour and design and humour. At the beginning of the Big Egg Hunt, on one secret night, all 100 eggs are hidden in the foyers of buildings, in shopping malls, and in special places on the streets of Auckland, Christchurch and Wellington and the hunt is on. It’s hard to resist. In Auckland I found two perched on the balcony of the Viaduct Events Centre with views across the harbour to the city. 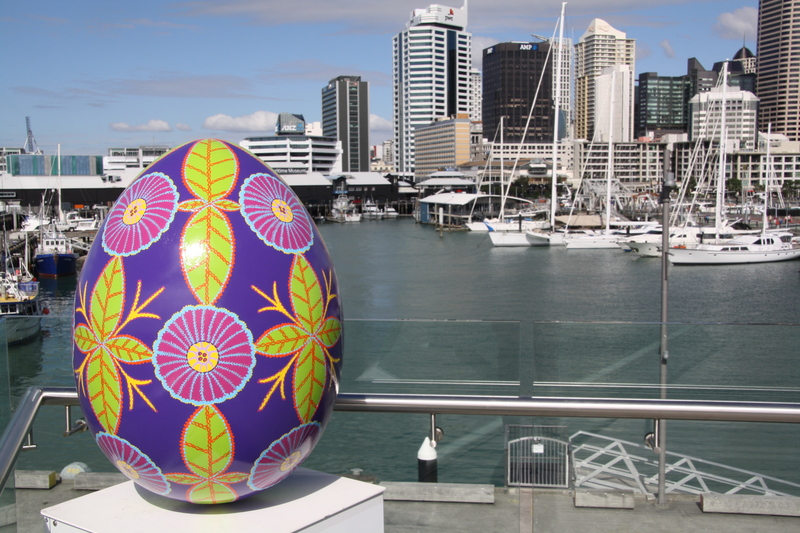 Egg number 6 by Daniella Hulme has the best location and my vote as the best of this year’s batch. Egg #6 by Daniella Hulme. My favourite. I found more eggs hidden in popular tourist spots like Victoria Park and the Art Gallery and in the windows of real estate agents, fitness centres and designer stores. In Christchurch I spotted them in the Re-Start Mall and in the streets around the broken city centre. My hunting efforts were insignificant compared to the 20 families who flew to all 3 cities to find them all. That’s egg-ceptional dedication! Back at the Museum, the 20 eggs sitting behind a single red velvet rope were too much temptation for small hands itching to test how securely the eggs were fastened to their white plinths. I caught the worried eye of a young lady from Starship as they began to push against one. “They’ve all been sold and their new owners wouldn’t like them to be broken” she said with more patience than I could have managed as she gently ushered the small folk to the right side of the red rope. We both looked at the parents standing nearby, oblivious to the disaster cleverly averted, with egg-asperation. I heard an American ask “What’s the significance of the eggs?” and the Starship lady started to tell the story of The Big Egg Hunt concept which started in London in 2012 as a fun way to raise money for charity (all the NZ eggs are auctioned to raise money for the Auckland Starship Children’s Hospital). The American listened appreciatively to her explanation. “Egg-cellent” he said. Fantastic story of the eggs ! Wonderful Auckland story . Thank you. It’s a such a great event. Let’s hope it does well for Starship. Just came across your article thank you so much for your kind words about my egg! Hi Daniella, So lovely to receive your comment. I wanted to buy your gorgeous egg but have no suitable place to show it off…I’ve loved your work ever since I bought ‘Pacific Memories’ and ‘Auckland Icons’ from an art gallery on Waiheke Island. They are my pride and joy, and the envy of my friends and family.